440 pages | 95 Color Illus. Contemporary events management is a diverse and challenging field. This introductory textbook fully explores the multidisciplinary nature of events management and provides the student with all the practical skills and professional knowledge they need in order to succeed in the events industry. It introduces every core functional area of events management, such as marketing, finance, project management, strategy, operations, event design and human resources, in a vast array of different event settings from sport to political events. • New and updated content on developments in technology, risk management and event volunteering. • New and updated case studies that include emerging economies. • New industry voices by international practitioners. Every topic is brought to life through vivid case studies, personal biographies and examples of best practice from the real world of events management. Written by a team of authors with many years’ experience of working in the events industry, Events Management: An Introduction is the essential course text for any events management programme. "The second edition of Events Management represents a step forward in recognising events as professional projects and will aid the continuing professionalisation of the events industry. The new edition has been well updated with event case studies which are truly international and which will enhance a student's ability to make the connection between theory and practice / real world learning." 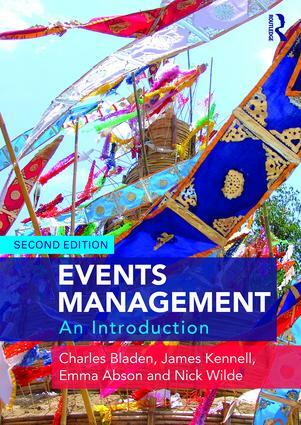 "The updated edition of Events Management: An Introduction continues to be a comprehensive and accessible textbook. The second edition covers the principals of events management plus key industry trends and developments in technology, the role of emerging economies and the importance of strategic event evaluation. The book retains all the key features of the original with updated case studies, making this the go-to study companion for event management students." 15.3 What is the media? Charles Bladen is Senior Lecturer in Marketing and Events Management at GSM London, UK. James Kennell is Principal Lecturer and Programme Leader for Events, Tourism and Hospitality in the Department of Marketing, Events and Tourism at the University of Greenwich, UK. Emma Abson is Senior Lecturer on the Events Management courses at Sheffield Hallam University, UK. Nick Wilde is an expert in sports marketing and sporting events management, with research interests in international sports marketing, which he has taught in many overseas institutions.